I love Orzo (look for it on the pasta aisle), when tossed with Feta cheese, red onions and cucumbers it makes a beautiful hearty dish that keeps well in the fridge. It can be served as a side meal or it can be The Meal. Pull me a bowl out of the fridge on a hot day like that and I’m in heaven! This whole scenario activated my drool glands; I rushed into the kitchen and like an artist in the making, I mixed cucumbers, red bell pepper, mukimame (shelled edamame), Feta and a touch of thyme leaves for fun. Looking at my bowl and thinking you gorgeous creature, I’m so ready to dig in and enjoy. 2. 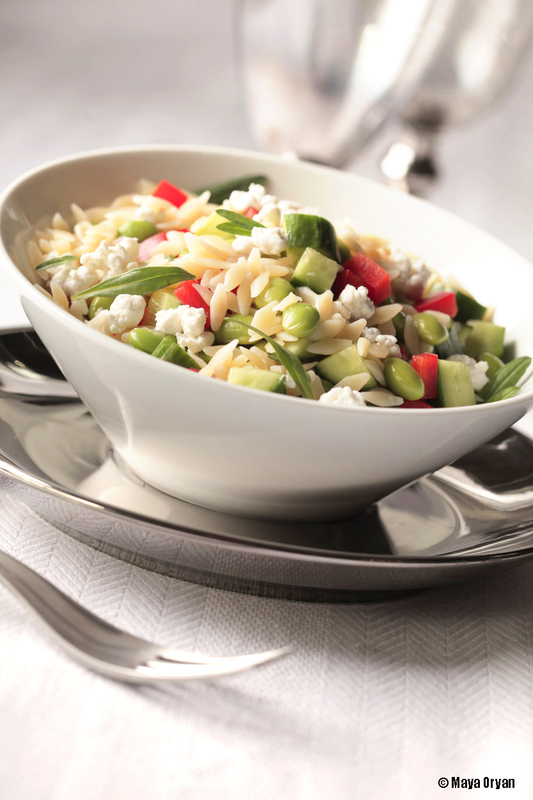 In a bowl, combine orzo, mukimame, cucumbers, feta, bell pepper, and thyme leaves. 3. Whisk together all the dressing ingredients and drizzle over the salad. Stir gently until all ingredients are well coated. 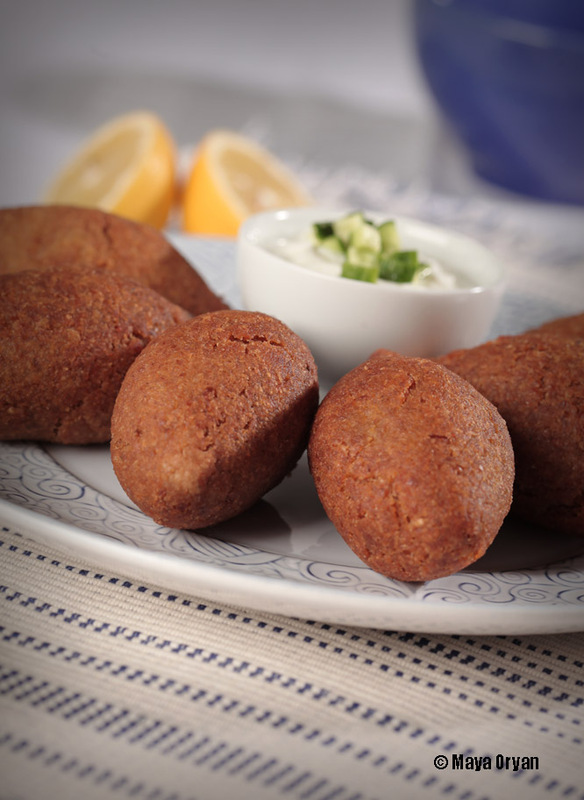 Yesterday was the last Sunday before Lent, or Ahad Al Marfa3, and is traditionally celebrated in our and many families across Lebanon by a gathering over lunch. The food preparation included the entire family and each one showed up –and off– with one of his famous recipes. There is no traditional food on this day, but the menu did include all kind of meat since most of us abstain from eating meat during Lent. So we sat feasting on Kibbeh, grilled seafood, barbecued chicken and I offered to bring lamb chops cooked in three mustards. Well the best part after eating was skyping with my brother and his family who, live in Canada, we raised our glass in a toast to them and together laughed our heart out. Keep smiling and cherish life! 1.Melt butter in a nonstick skillet over medium-high heat. Add onions and cook until wilt and starting to brown. 2.Season the lamb chops on both sides with kosher salt and pepper. Place it in hot skillet, and cook for 1 minute on each side. 3.Add the wine and cook the meat for further few minutes until opaque or desired degree of doneness. 4.Add the 3 mustards and stir well to coat the lamb chops. 5.Stir in the fresh cream and cook until it starts to bubble. Do not allow to boil. 6. 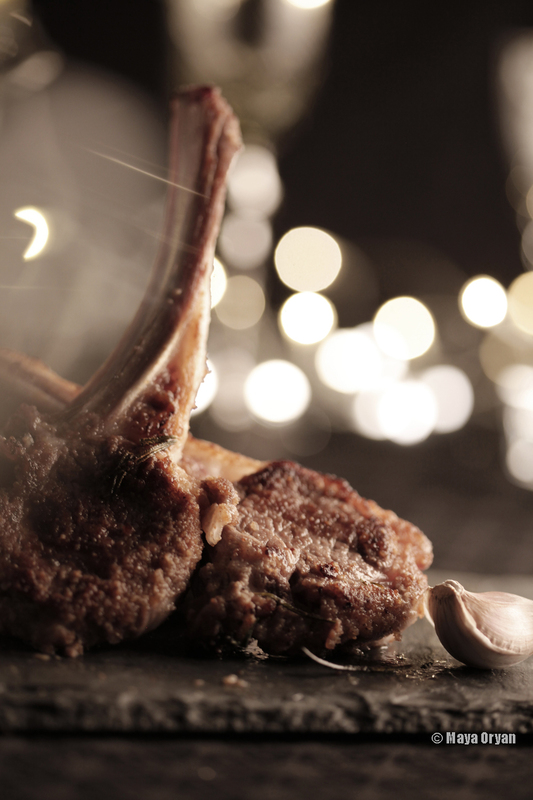 Arrange the lamb chops on dinner plates. Top with the sauce or serve on the side. My husband has been away for the past 10 days, so little action since he’s gone. Taking it easy, sleeping more, working out more, (cooking less), playing with the kids and drawing together, volunteering for school where I can see my girls in class and all the things I love and I miss doing. Next week is going to be a busy week for me more photo shoots and more food styling. LIVE Broadcasting from the gym, writing this post after my 5km run and feeling proud! I present you “Batenjein Raheb”! A vegetarian Lebanese dish, made of grilled eggplant mixed with olive oil and lemon juice, seasoned with salt and topped with fresh parsley, tomatoes, cucumber and pepper. I don’t remember when did I shot this picture with Serge but am happy to find it because it’s one of my favorite salads especially during Lent, which is starting on Monday. I love this time of the year, a time of prayer and reflection for many, and a period when people are closer to God. During their fast they abstain from eating meat and vegetarian meals come more in fashion. 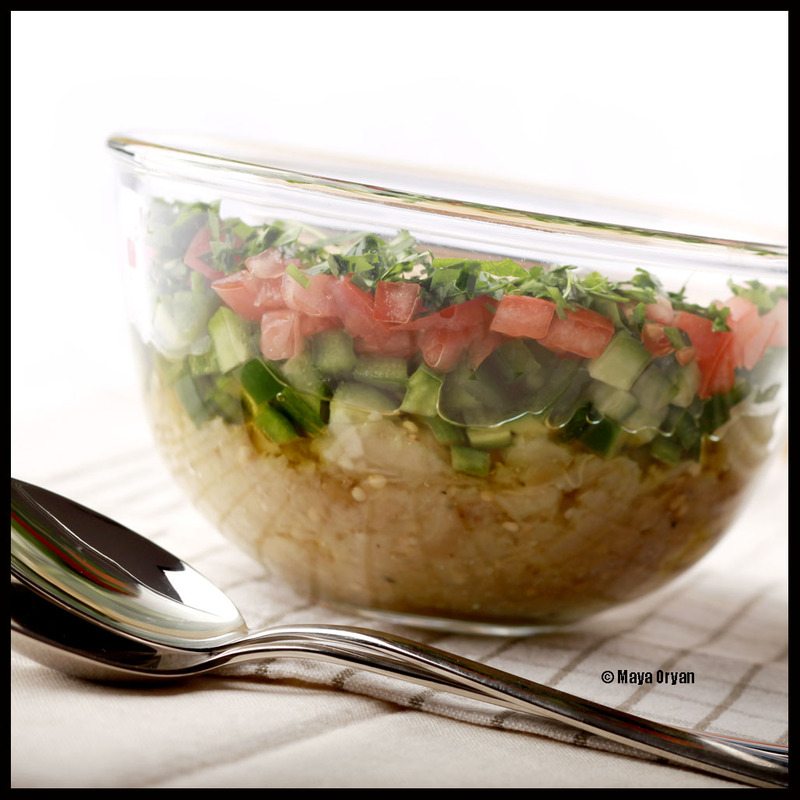 The Raheb salad for me is easily a main course especially when eaten with bread. I sure prefer to grill my eggplants at home and eat them fresh, but for those who have little time in the kitchen, grilled eggplants come also in jars and are very tasty. 1.Pierce the eggplant with a fork, cover with foil and char grill over the stove burner on all sides. This will take around 15-20 minutes pending on how large is the eggplant. Alternatively, it can be grilled inside the oven on a baking tray for about 30 minutes. 2.Remove from heat and allow to cool. 3.Peel and scoop out the grilled pulp and discard charred skin. The pulp can be sieved to reduce the water. 4.Place the pulp in a bowl and mix with olive oil, lemon juice and salt. 5.Layer with peppers, cucumbers, tomatoes and parsley and serve.